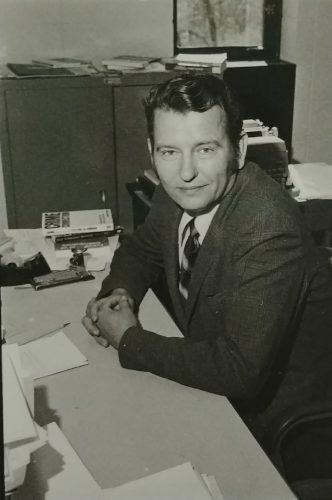 > CITATION: Joseph Motivans, interviewed by Howard Fredericks, UWL Oral History Program, UWL Murphy Library Special Collections and Area Research Center, 1993, La Crosse, Wisconsin. Joseph Motivans had an amazing life. He was born in 1932 Latvia, a Baltic country in the Eastern part of Europe. He grew up in Latvia, became a refugee in Germany, came to the United States, worked as a sharecropper when he was only 16, was drafted into the Korean War, went to college, and eventually taught at the University of Wisconsin- La Crosse. The section from his childhood to his eventual service for the United States is particularly interesting, so that is what this FFA will follow. If you are looking for a child’s perspective on being a refugee in World War II, and the immigration process after the war, then this oral history would be perfect for you! This collection is an oral history, and is available to listen to or read. This FFA follows the typed transcript, and focuses on some of the more amazing parts of his life, like how the threat of communism forced him to leave his home. This Finding Aid is separated into its three focuses: 1) “Childhood in Latvia,” 2) “Escaping the Russians and WWII,” and 3) “Coming to the United States.” Any one of these would make a great National History Day project! In the first portion of the interview (Childhood in Latvia, p. 1-44) Motivans introduces himself, and talks about his family, and their lives. He then describes life in Latvia, and his childhood. He also goes into detail about school, meals, summer vacation, and life on the farm. It is an overall description of the Latvian culture. In the next section (Escaping the Russians in WWII, p. 56-125), Motivans describes his experiences in World War II. He talks about how the world was so focused on Hitler that Stalin just swept in under the radar to take the Baltics. He talks about the Communist takeover, mass deportations, purges, hiding from the Russians, his family’s escape, life in the refugee camp, riots, and life after the war as a “displaced person.” He also tells how he lived in the camps. You might be surprised to learn that he got an education, and at times he had fun! In the final section (Coming to the United States, p. 125-147), Motivans talks about his life in the United States. He came over when he was just 16. He talks about how he got here, his life in Mississippi, how the WWII refugee and Black population got along, and college life. Pages 1-11: Motivans introduces himself and gives some basic background knowledge such as: birth place and date, when he came to the United States, and where he grew up. Motivans explains the economic depression that was occurring in Latvia at the time of his birth as well. These are important pages to read for understanding his life and times. Pages 11-17: This is where Motivans describes Latvia after World War II. Motivans discusses the political climate in each of the main countries that make up the Baltic region. Then he talks about Latvia and how there were many political parties and how communism was rising. (At the time, Latvia was independent and creating its own democracy, but the Russian threat was near.) Read these pages to find out how the Russians threatened Latvia’s new found independence. Pages 33-38: In this small, but important section, Motivans talks about medical care in Latvia, and about the role sorcery played. Did you know that there were not many doctors at the time and that people relied on the town “expert” who would use magical powers to heal them? Motivans pulls from past experiences to describe the time he broke his leg. Pages 38-41: Motivans discusses social life in Latvia in this section. He talks about drinking, pastimes, and holidays. Remember being read to when you were younger? You can read about Motivans’s bedtime stories and cultural events here. Pages 41-44: This is where Motivans talks about what the Latvian people ate. He talks about how the harder you worked, the more varied your diet became. He also discusses the meals had at certain times of the year, like holidays. Did you know that during certain holidays people had to fast? Pages 56-60: Motivans begins with the Communist takeover in the Baltics. This was all done legally, and there was nothing anyone could do about it. Read here to see what the Motivans family thought about Jewish people. Pages 60- 69: In this section you can learn about how the Communist takeover affected every aspect of life, even language! He begins telling his memories of his neighbors being deported. He tells who was first to go, what they brought with them, and where they were sent. How do you think this affected Motivans’ daily life? Read here to find out. Pages 69-76: Motivans talks about when his family thought they were next on the list to be deported to Germany. Their saviors were the German Nazis! If you think you have heard everything about the German and Russian armies; read here for a new perspective. Pages 76-89: Here is where Motivans and his family escape Latvia. (They decided that being in Germany would be better than going to Russia.) Read here for the heart-racing escape of Motivans and his family. Pages 89-98: In this section Motivans describes being transported in Germany, packed like sardines in railroad cars. Once in the refugee camp, he talks about how he and his family got supplies and survived. Read here to see what it was like. Pages 98-102: Here Motivans discusses riots in the camp, and how they got started. Next he tells how he and his family were sent to a different camp, and almost got sent to Siberia! Pages 102-125: In this portion, Motivans talks about what happened after the war. He and his family could not go home so they continued to travel west to another camp. He describes his education, the Black Market, gangs, books, alcohol, dental care, and what it was like living in an American Zone. Motivans talks about how he handled all the changes, the mixing of rural and urban populations, and the segregation within the camps. Could you imagine moving to a new place with a lot of different people who speak different languages? Read here to see how Motivans handled this. Pages 125-130: Motivans discusses how the immigration process worked in 1948. Oftentimes when you think of immigration, you might think of Ellis Island. See how different Motivans’ experience was by reading here. Pages 130-135: Here is where Motivans talks about his life in Mississippi. He and his family were sharecroppers on a cotton plantation. Working on a plantation was hard. Do you think Motivans still got to go to school? Read here to find out. Pages 135-138: Here Motivans discusses the relationship between the Black population and the refugee population. He then goes into the relationship that the refugees had with the Southern Whites. How do you think refugees were welcomed after World War II? Read here to find out more. Pages 138-147: Here is where Motivans discusses his family moving to Walls, Mississippi. Motivans talks about high school, junior college, and cultural influences that changed his life, like smoking. During the 1950s you might think about greasers and poodle skirts. Read here to find out how Motivans fit in with this!